will even don ceremonial robes when the circumstances call for them. In April of 2006 the Wakayama Electric Railway converted the Kishi Station to an unmanned station (along with many others). The neighboring grocery store was recruited to act as station master when the need arose. The owner of the grocery store would feed the neighborhood stray cats at the station. Enter Tama, a stray calico with charm and charisma, and an enjoyment for turning strangers into friends. 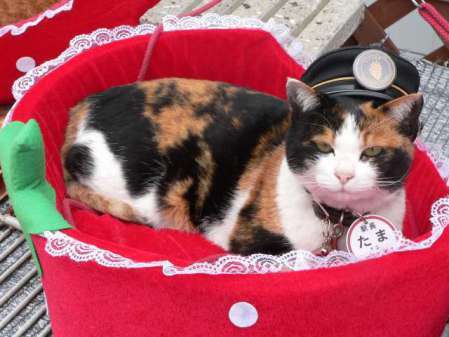 A year later Tama was named the official stationmaster by Wakayama and given her own "office." The unused ticket booth was transformed into her own kitty condo complete with litter box. Two other cats live with her there. Every day, wearing her stationmaster's hat, Tama greets the trains and passengers. She is not shy about accepting a friendly ear scratch or pat on the head either. Tama, the Stationmaster in Repose (Photo by Takobou/Creative Commons via Wikimedia)The once failing railway line is now in the black as people flock to the Kishi station to meet Tama and get their photo taken with her. In 2008 she was rewarded with a promotion to super stationmaster. She even deigned to be robed for the ceremony with the president of the company and the mayor. In 2010 she received another promotion to Operations Officer in recognition for her increase in customers for the railway. She handles both positions with professional aplomb, and is the first cat in history to become a railway executive. .
Tama is estimated to be worth ten million dollars in promotional sales to the company, as well as increased ridership and tourism. She has also provided a considerable boost to the local econmoy. She takes her salary in cat food and kitty litter, and is said to be the purrrfect employee. Who knew that dressing up a cat could make so much money, not to mention the piles of good will? Welcome Clean Meat! Your Pet Is Going To Be A Foodie!